Call (207)831-3222 Today Firewood for Sale! Your one stop shop for Quality Maine Firewood Seasoned or Green! Wooden Nickels is a Maine owned and operated company that proudly serves the greater Portland, Maine region along with Falmouth, Maine, Gorham, Maine, Windham, Maine and more. We Have High-Grade Firewood for Sale! We offer clients the highest quality firewood for sale. Rot-free seasoned dry or green hardwood. When it comes to firewood, we can just about do it all! When it comes to high-grade firewood supplies, we are your go-to source in Gorham, Maine and the surrounding areas. Whether you are a resident or a contractor, we have top-quality firewood for sale. Whatever your needs are, our staff will gladly help you determine the best type of firewood for your requirement. All our products are competitively priced and will be promptly delivered to your location. Get in touch with us today for more details about our firewood for sale. No matter much firewood you need or where and when you plan to use it, we have the best firewood for sale for burning in fireplaces, fire pits, bonfires, and more. We source only superior firewood. We sell seasoned wood, hardwood, and other variants cut to the specific sizes you need. We can even deliver the supplies to your preferred location. We serve clients in Yarmouth, Maine. If you are looking for firewood for sale, call us today. We work closely alongside our customers, and can cut your firewood to ANY size request in Yarmouth, Maine, Windham, Maine and more. It's this client-based approach to business which truly sets us apart from the competition. In addition to our excellent service and prompt delivery, you will find our prices to be very competitive. Simply put, We don't think you should have to empty your wallet to receive our unbeatable products! On top of that, we even offer guaranteed full cord Measurements. Call us today and set up a Free Delivery!! So, how are you supposed to determine the quality of firewood? Moisture content is easily the most important quality to look for in your firewood. Firewood with a moisture content higher than 25 percent will burn, but it will be hard to light and keep them burning and they will make a lot of smoke. In addition to this, much of its energy content will be wasted right up the chimney. Firewood should be between 15 and 20 percent moisture to burn properly. To get that dry it must be split and stacked in the open for at least a full summer. Regardless of species, all wood contains about the same energy content per pound. That being said, different species DO vary in density. Traditionally, the favored trees in central North America were oak and maple because they are very dense and will eventually lead to the creation of long-lasting coals. The BTU, or heat content, of a fire depends on several properties of the firewood, including density, amount of resin and moisture content. Softwoods are less dense than hardwoods because they have a higher resin and moisture content. All firewood dried to the same moisture content contains approximately the same BTUs per pound. However, the densest woods can be dried more, which makes more efficient firewood. Firewood with low moisture content produces more BTUs than green firewood. This is why the best firewood has been seasoned, or dried. Properly seasoned firewood has about 7,700 BTUs per pound, while green firewood has only about 5,000 BTUs per pound. To get the maximum BTUs from your hardwood firewood, allow your firewood to air-dry for six to eight months after cutting. This will reduce the wood's moisture content by around 15 to 20 percent. High resin content in the wood can also lower BTUs. Hardwood should be cut during winter or early spring, when resin levels are lowest. To increase the BTUs from your firewood, store the wood outside in a covered area at least 25 feet from the house. The stacked wood should be kept free of weeds and debris. These measures will increase air circulation around the wood, keeping it dry. Only keep small amounts of the wood indoors. If wood is stored inside, the heat may cause insect eggs to hatch or fungi spores to mature, which will cause the wood to rot. CALL WOODEN NICKELS Firewood today! Always On-time, Always Free Delivery! We currently offer firewood to all the residents of Gorham, Maine and Falmouth, Maine. If you happen to live in Portland, Maine or Cumberland, Maine, what are you waiting for? Pick up the phone today and speak with one of the friendly representatives here at Wooden Nickels. 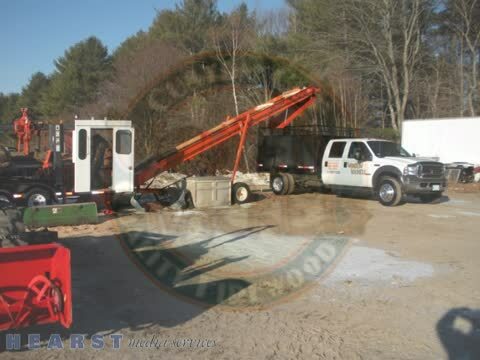 We love providing Yarmouth, Maine residents with unbeatable service and even better firewood for sale!